the idea is easy to execute! I call this “baptizing” your Bible – taking that first step to immerse yourself in creative worship! Choose an introduction or index page, making sure it’s on Bible paper (some use heavier paper for those pages). Use this for testing – and rather than just making blobs of color to test mediums and hues, create a beautiful design that won’t make you cringe when you flip past it! In the video below, you’ll learn how to make a stained glass type of page and test out watercolors; note that some inexpensive brands can bleed (Crayola), as well as one expensive brand (Peerless), so it’s important to test the watercolors you have. The same technique can be used to test all sorts of mediums! Adapt it by making plaid patterns, or circles – anything that will be a pretty pattern overall. And be sure to mark down which brands or shades you’re testing. (Warning: On my first test page for markers, I wrote down “Blue” in a blue marker, “Red” in a red marker….but never wrote down which brand, so I had to re-test everything to know which pens would work without bleeding!) You might write the brands onto a piece of tracing paper to insert as a tip-in (a page to be taped or glued into the Bible) or write them on the back of the page for each test section. Once there is some art in a Bible, it can often be encouraging to create another page – but that first one can be hardest. 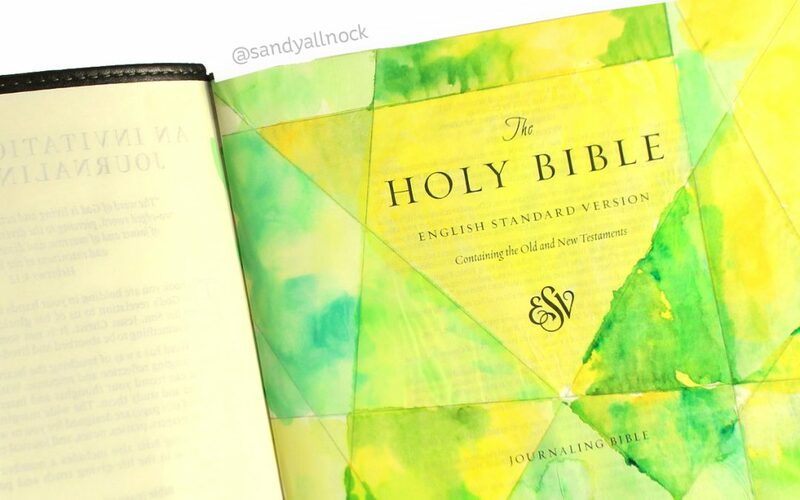 We want to make our first page “perfect” – but remember….the whole idea of Bible Journaling is not about perfect art, it’s about growing in our relationship with Jesus!